Gómez et al. 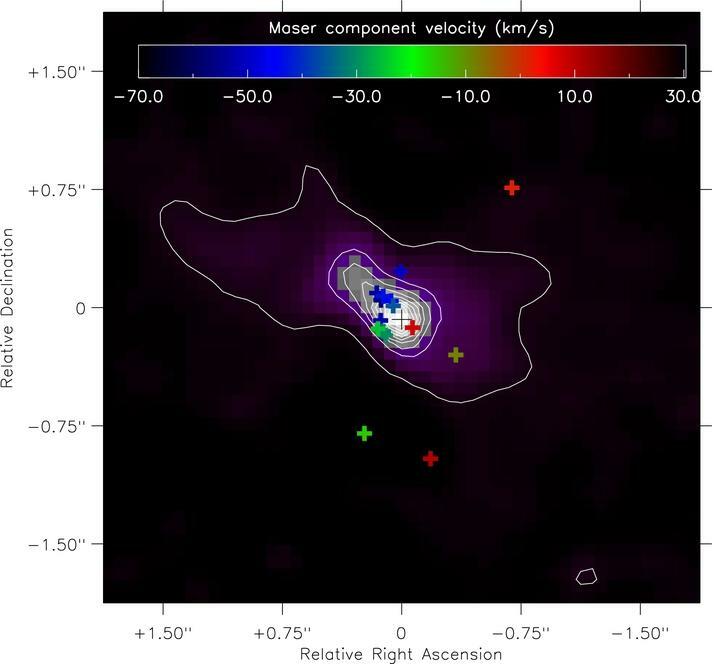 (2015) have used the Australia Telescope Compact Array (ATCA) to map the water maser emission in IRAS 15103-5754, an object that has just become a planetary nebula. Its water maser emission spreads over a large velocity range (75 km/s) and most of it traces a collimated jet aligned with the infrared nebula. This is characteristic of a special type of evolved stars called "water fountains". IRAS 15103-5754 is the first known case of a water fountain that is already a planetary nebula (all others are in previous evolutionary stages. However, the velocity pattern of masers is different from that in other water fountains: it is consistent with a short-lived, explosive event, rather than with a steady jet. This suggests a fundamental change in the characteristics of mass-loss as a star enters the planetary nebula phase. The figure represents the maser components (crosses) superposed on a mid-infrared image (at 12.81 microns) obtained with the Very Large Telescope (VLT) by Lagadec et al. (2011). Credits: 2015. The American Astronomical Society.